5 cylinders and 23.000 rpm ! In the Sixties, the Japanese factories - bent on the conquest of Europe - launched themselves into a crazy technological scramble for the winner's circle in the world racing championship. Until the ban in 1967 on 50cc and 125cc engines with more than two cylinders and more than four cylinders in the larger displacements, Honda championed the fourstroke engine, which used extra cylinders to make up for the power it lost to two-stroke models. The error of this approach was apparent in the 125cc class where Honda, world champion with two and four-cylinder engines, competed against the increasingly potent two-stroke twins of Yamaha and Suzuki. 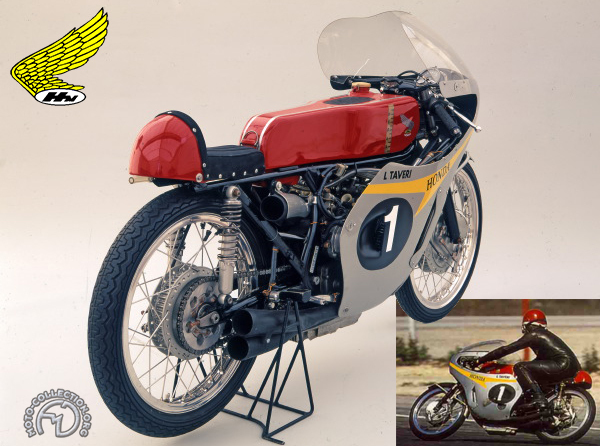 The two-stroke cycles ruled the championships in 1965. To counter this challenge, Honda engineer Irimajiri - designer of the marques 50cc twins and its six-cylinder 250 - created a five-cylinder four-stroke made entirely from magnesium, for 1966. This amazing feat of engineering had pistons just 35 mm in diameter and cranked out 23,000 rpm yet stalled below 17,000 rpm, forcing the rider to work the nine-speed transmission relentlessly to keep the engine running! The Honda 125 proved unbeatable in the hands of the talented Swiss cyclist Luigi Taveri. It would force Yamaha, Suzuki, and Kawasaki to go to four-cylinder two-strokes for the 1967 season. The Swiss rider Luigi Taveri specialized in riding tiny racers. He was the three-times 125cc world champion riding Hondas.